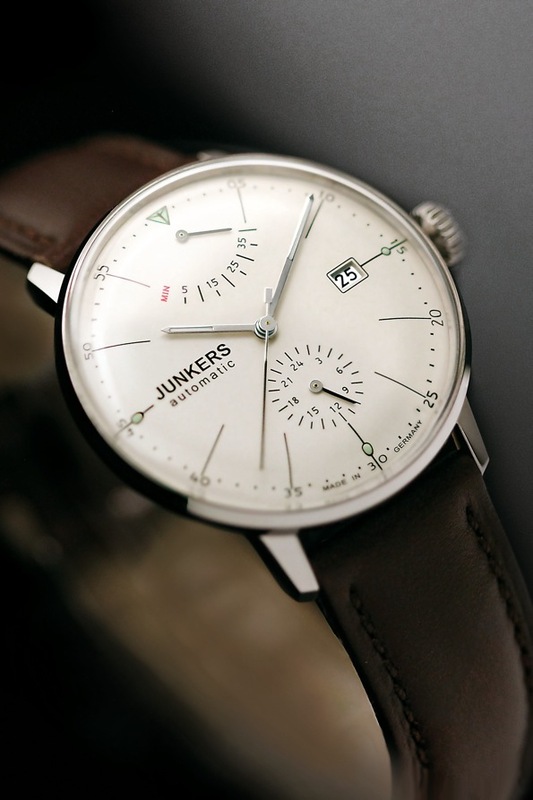 This variant of the Junkers Bauhaus watch comes with a power reserve meter at 12:00 and a 24 hour sub-dial at 6:00. The beautiful creamy white dial features thin hour markers (very Junghans) with luminous dots and a 60-minute scale. The silver hour and minute hands are luminous filled and a date window is shown at 3:00. Inside is a modified 26-jewel Citizen self-winding movement with a silver rotor that is viewable via an exhibition case back. The result is a very attractive watch with a very handy power reserve indicator. The 24 hour dial gives you the option of military time. It also features a domed Hesalite crystal. Case: Satin finish stainless steel, 40mm x 11mm thick. 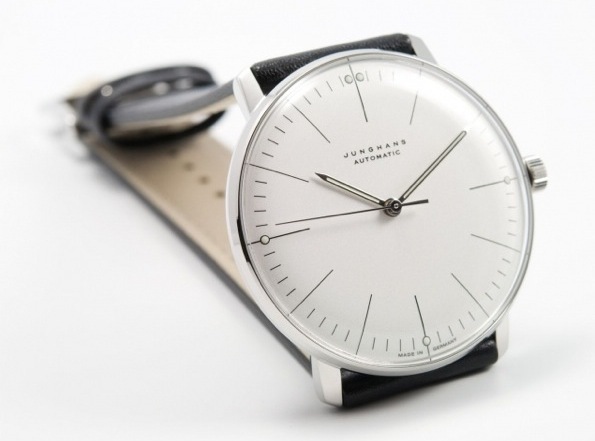 This watch comes in at around 450 Euros but its refreshing minimalist bauhaus looks make it a Beastie Folly winner, destined for the Wall of Want. 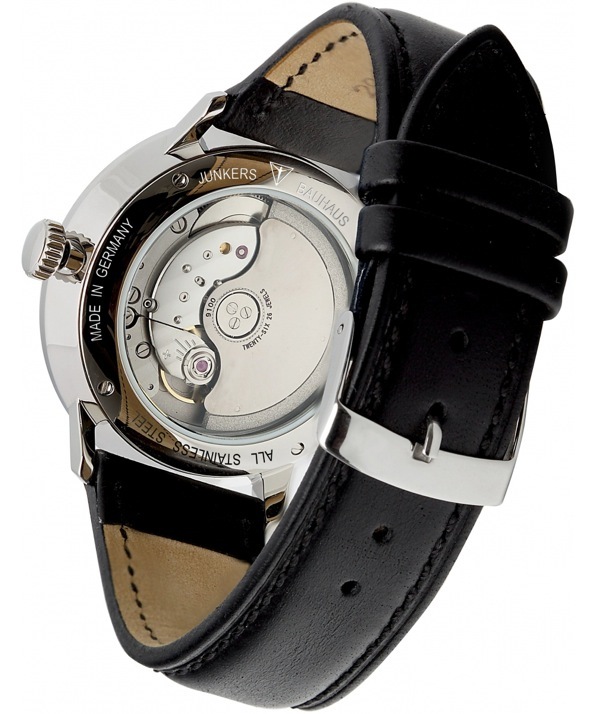 Categories: Junkers, Watch Blog, We Wants Muchly | Tags: Junkers, power reserve, watch, watches | Permalink. The literal translation is “house of construction”. Bauhaus was a school in Germany that combined crafts and the fine arts, and was famous for the approach to design that it publicized and taught. The Bauhaus style, also known as the International Style, was marked by the absence of ornament and ostentatious facades and by harmony between function and the artistic and technical means employed. The Bauhaus school was founded by Walter Gropius in Weimar and operated from 1919 to 1933. The Bauhaus style with its all encompassing philosophical approach to design was hugely influential in modern design across a range of disciplines including architecture, crafts and industrial design. Bauhaus design can be characterized by its functional minimalism and the rejection of ornament. The idea that ‘form follows function’ is at the heart of the Bauhaus style and ” art for art’s sake” is overtaken by the blending of art with function, or put simply, functional style. Although minimalism is prevalent in the manifestations of Bauhaus, do not confuse Bauhaus with pure minimalism. To explain this in terms of a watch face, minimalism might strip out the markings on the face to batons for 3, 6, 9 and 12 but in truth this would be the triumph of form over function, as telling the time on such a watch would be less accurate than having markers for all the minutes. Bauhaus seeks to achieve a clean minimalist form but not at the expense of function. The Junkers Power Reserve at the bottom of this feature might at first glance be dismissed as not Bauhaus by some, as it is too cluttered, having a power reserve and a smaller dial for military time. These though are genuine functions, so the Bauhaus mission would be to include them but to achieve an overall clean and unadorned look. The watch does this beautifully. The first watch here is a Junghans Max Bill automatic and a nigh on perfect example of Bauhaus design in a watch. 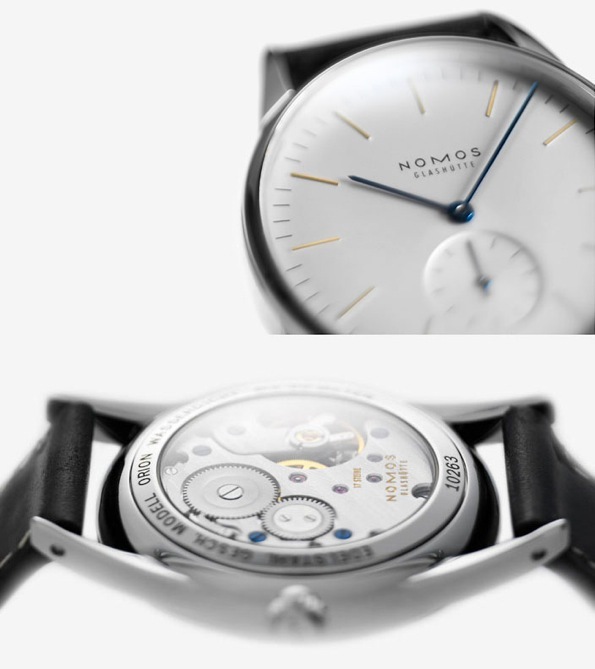 The second watch is a Nomos Orion which again is a very pure Bauhaus look. The first Nomos watches were designed in 1990 in the Bauhaus purist style by Susanne Günther and have won several design awards as a result of this “minimalist” style. 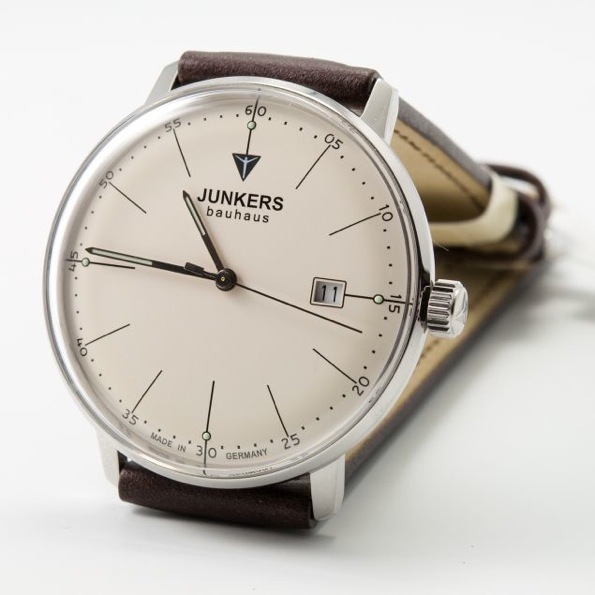 Finally two offerrings from Junkers, the overtly Bauhaus three hander which comes as a quartz with “Bauhaus” written on the face and a more expensive automatic version where “Bauhaus” on the face is replaced by the text ” automatic”. Clearly Junkers believe that the quartz purchasers need to be told that this is a Bauhaus style, while the more discerning automatic brigade clearly have the sense to work this out for themselves! A tongue in cheek observation, as in truth I would be happy to have any one of these Junkers in my watch collection, which is in fact also the case for the Nomos and the Junghans. This for me is a case of style over brand as the style is a winner in all three flavours – just take your pick and go Bauhaus. Categories: Junghans, Junkers, Nomos, Watch Blog | Tags: Junghans, Junkers, Nomos, watch, watches | Permalink.